When a Man Loves — When Han Tae Sang Loves… or When Chang Hee Loves? The plot is so interesting to begin with. It may seem very ordinary in the start, and very Cinderella story-like drama wherein a rich man likes a poor girl. It also involves one side love, jealousy, selfishness, hatred, etc. It gets complicated in every episode as new revelations and secrets are revealed. I find this really unique but, one thing that I also liked about the drama is that the female lead, Seo Mi Do, actually is a two timer. I’ve seen many dramas that involves two-timing but not from a nice female protagonist. Sometimes, I get confused with what’s going on in her head. The male protagonist, Han Tae Sang, is a gangster who changed his life after seeing himself in Seo Mi Do. He decided to quit his gangster life and made a new beginning seven years after. He became the President of the Golden Tree Company. Even after seven years, he always had only one girl in his heart. He will do everything for Seo Mi Do. But sometimes, he acts too selfish when he doesn’t get his way that you’d see the gangster in him– one of the reasons why Seo Mi Do feels scared of him. Han Tae Sang is also a pitiful character because he’s lonely and doesn’t have a family. Although some of the events were quite unbelievable and dumbly written, I still found it enjoyable to watch because it was fast-paced and the continuous revelations left me curious until the last episode. There was a point when I hated all the characters. There were many instances that the script made them act so dumbly and stupid. Nonetheless, I still loved them for their outstanding acting. 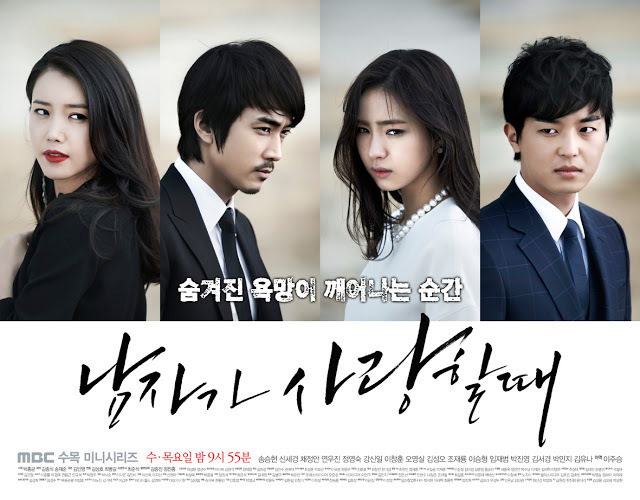 Shin Se Kyung as Seo Mi Do — The choice of the actors in this drama are fit for their roles..except for Shin Se Kyung. I thought maybe someone could be a better choice for Seo Mi Do’s character. She’s expressionless most of the time and couldn’t match with Song Seung Heon. Seo Mi Do’s character was interesting though. Seo Mi Do is quite unique from all other female protagonists. You’ll love her in the start, but you’d end up hating her instead. Shin Se Kyung is not my favorite actress; I don’t buy her stone-faced acting. Song Seung Heon as Han Tae Sang — All praise for Song Seung Heon because he did an amazing job in this drama. I’ve seen him in My Princess but I’d actually say that I fell in love with him and his character in here. He was perfect for the role. In the first half of the drama, we could see the childish, cute, playful Tee-Tee who’s trying to woo his girl. He has no dating experience so he read and printed out guides from the internet on how to date a girl. Yet on the latter half of the drama, we could see the scary, beastly, monster-like character in him. On the top of that, you’d pity him. I like the way how he was able to portray it well; contrary to his acting in Dr. Jin -.- After watching this drama, I see him differently now and gained my respect for him as an actor. Chae Jung An as Baek Seung Joo — the typical female antagonist. Her acting was fine and her looks was suitable to be a mean girl. Yeon Woo Jin as Lee Jae Hee — I liked how he portrayed Lee Jae Hee. He was loveable in Guam, but it was completely a different story back in Korea. I think his acting was great because he was able to make the audience hate him so much for stealing his friend’s girlfriend. He wasn’t grateful for what Tae Sang has done to him. Kim Sung Oh as Lee Chang Hee — I have to mention him in here, because he definitely deserves a special mention. I’ve seen Kim Sung Oh in Secret Garden and he was definitely funny there. In here, he portrays as the best friend of Tae Sang. He wasn’t smart and he was also a gangster in the past. I’ve read somewhere that When a Man Loves is all about Lee Chang Hee loving Han Tae Sang. I hate to admit it, but it’s truer than Han Tae Sang loving Seo Mi Do. (I mean Tae Sang already gave up in Mi Do during the latter end) On the other hand, Chang Hee was willing to do anything for Tae Sang. Even if Tae Sang tells him to eat s**t, maybe he’ll do it too. I think the scriptwriters didn’t like this character at all; because Chang Hee was completely stupid in his actions. I guess not everyone was satisfied with the ending. For me, the last scene was acceptable and not a cliffhanger. Mi Do visits the bookstore and met Tae Sang who is now the owner of the store. He says he can’t hire her as a worker because he might like her again. Mi Do also said that he can’t make her leave because she might like him again. It signifies a new beginning for the both of them and probably they’d end up with one another again. I like it to end that way and for me that is better rather than saying that they got together again. I’m just not satisfied with how Mi Do and Jae Hee wrapped things up. It’s still kind of vague for me that their relationship just ended like that. I still can’t understand how Mi Do thinks. Her feelings were wavering, and then suddenly she went back to Tae Sang again after realizing his good intentions. As for Jae Hee, he just disappeared like a bubble and he became useless in the last few episodes. I would love to see a scene where there’s a family gathering with the four sons around plus the mother. I think that would make the ending more complete. I always download the soundtrack after watching every drama. I’m disappointed because they didn’t focused much on the soundtrack. The instrumentals didn’t help much and the songs were not strong enough to leave an impression on them. I only liked one particular song which was sung by Baek Ah Yeon called “Introduction to Love”. It’s beautifully sung and I had goosebumps after hearing that song in the drama. This has become one of my personal favourites. It’s one of the melodrama series that I appreciated and loved. Not too heavy; it was just right. I really liked that the drama was fast-paced and as if there’s no dull moment. I didn’t feel it was draggy or boring at all. It’s probably my best drama of the first half of 2013, but I know nobody will agree with me. Although the script may get messy and dumb, I still liked the unique plot. Tired of romantic comedy dramas? This would be a perfect choice for you! Thanks for the great review of When A Man Loves 남자가 사랑할 때! I enjoyed it a lot. I added it to my collection of reviews for the show. The show has now an average score of 82.5%%.